This week we talk with the lovely Susan Lankester about the upcoming double bill of 'What'll Break You" & "Apocalips", directed by Ida Nerina and written by Ivan Yeo with a stellar cast featuring Gavin Yap, Zahim Albakri, Vince Chong, Stephanie Van Driesen, Tania Khan and Ash Nair! But it's not all pimpage - we also discover Susan's views on the local theater industry and have a wonderful time doing so. And for all you budding writers out there - did we mention that you can e-mail Susan your scripts? Who knows, maybe the next play Catwoman Productions brings out might be yours! The video above pretty much says it all! 7 Local Bands headlining the show yo. For a write-up on Junk - click here. For the Facebook Event page - click here. "...P.Ramlee was hailed as Asia's Charlie Chaplin..."
Was feeling a little nostalgic and came across this video. A Malaysian creative talent that will never be forgotten. I know we've been pimping out Bunohan a lot but this is too cool - director Dain Said interviewed in the illustrious Filmmaker magazine on their website! Click here or the picture above to read the whole article. 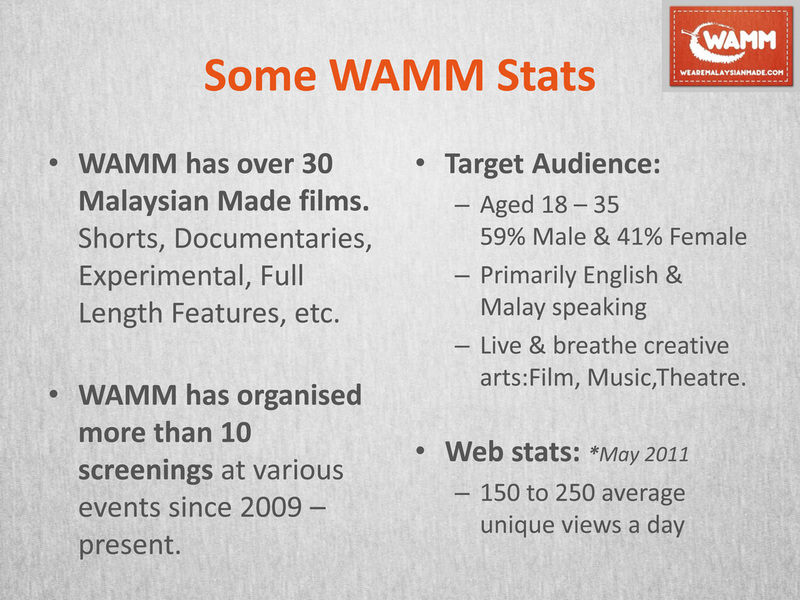 Happy Deepavali to all from WAMM! Check out this little video I found! On behalf of the WAMM family, Happy Deepavali to all Malaysians! 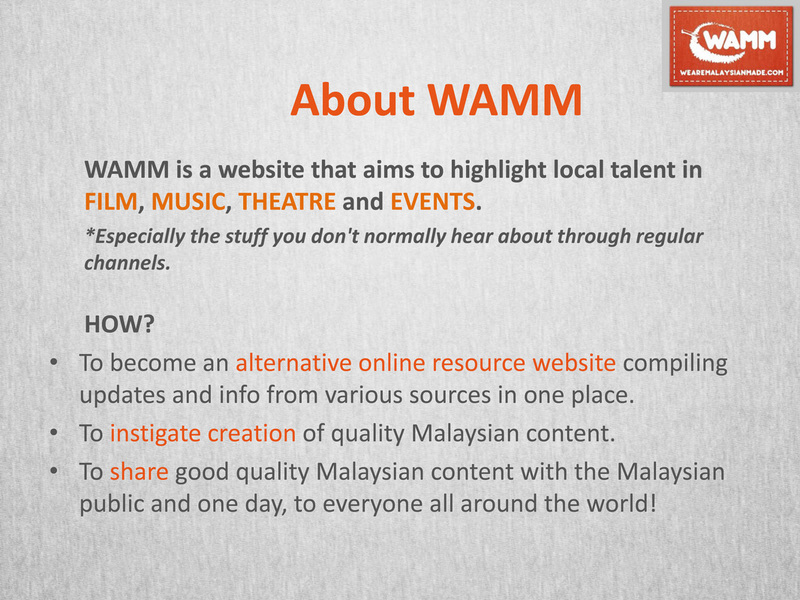 WAMM has a youtube channel! We'll be posting up whatever videos we can on it from now on, starting off with this - Khairil M. Bahar went to talk at the BMW Shorties Judges Clinic over the weekend and recorded a little video of what it was all about it in the process. If you haven't entered the BMW shorties yet, what are you waiting for? WAMMcast: Episode 6 - The Horror! boiling Khai's blood to no end. CEO Michael all gooey inside. wanna help out with WAMM. We're always looking for fresh blood! WAMMcast: Episode 5 with KL 48 Hour Film Project! Episode 5 is here and this week Amelia and Khai find out more about the KL 48 Hour Film Project! Producer Shahril tells us why he brought the competition to Malaysia, his experiences bringing the Malaysian winners to the Miami International Film Festival last year as well as a lot of information about the competition that'll be incredibly helpful to those that are entering the competition. As always, the conversation meanders into the realms of Francis Ford Copolla, 50 Cent and whether or not Americans know where Malaysia is if they haven't seen Entrapment. And if you're a filmmaker who hasn't entered the competition, have a listen and realize that you should enter! You've still got a week to register! You'll also find out about the other film contests that are tied with the 48 Hour Film Project such as the National Film Challenge, Go Green and more! Oh, and did we mention we're on the iTunes Store? Go subscribe!